Jack in the Box formed a partnership with E-Sports powerhouse, Team Envy. We were tasked with creating a booth experience at the Seattle Call of Duty World League Tournament, to get fans excited. So, what did we do when Team Envy asked us to do the same thing for the big event in Anaheim? We did it... Better! We worked with an illustrator to recreate Jack and the players in an old-time WWII propaganda style which showcased this atomic partnership in a :30 in-arena broadcast. From the in-arena video, we created a photo op where fans could come by the booth to take photos to share with friends on social media. 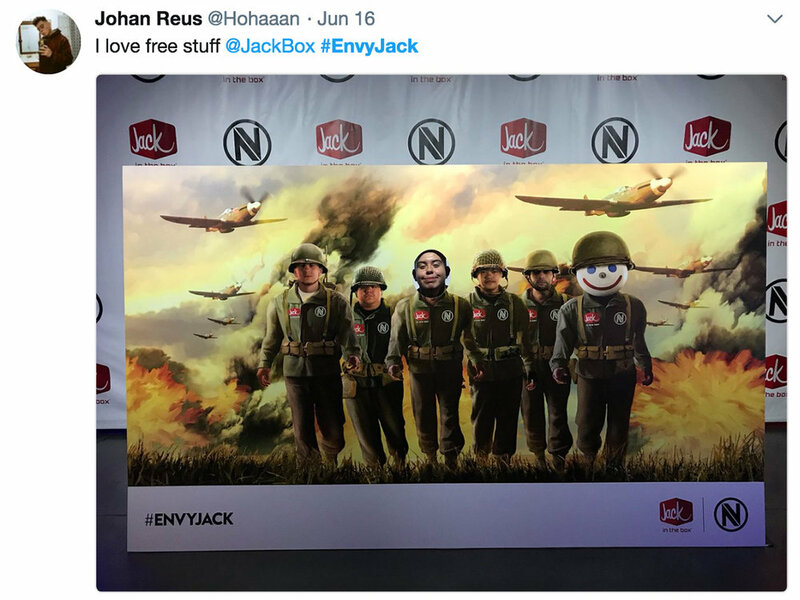 By sharing their experience on social media with #EnvyJack, fans collected swag bags, which came with propaganda-style posters, dog tags, a t-shirt, coupons with COD points and most importantly... Free tacos! We also provided everyone in the arena with an encrypted guide for special morse code videos that aired each day of the event. The first person to decode the message received an exclusive prize... A signed Team Envy jersey!